At this Texas school, 100% of fifth graders with dyslexia met or exceeded the 2018 Texas STAAR reading requirements with 60% demonstrating two years growth. These students demonstrated significant improvements in reading comprehension and vocabulary skills with an increased level of reading engagement and a deeper desire to learn using human-read audiobooks. 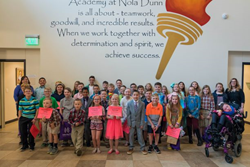 Ninety-seven percent (97%) of elementary students with dyslexia at The Academy at Nola Dunn, in Burleson, Texas, met or exceeded the Texas Reading STAAR this year and placed third in The Great Reading Games, a national reading competition offered by Learning Ally. In her fifth grade classes, 100% of students with dyslexia met or exceeded the 2018 Texas STAAR reading requirements with 60% demonstrating two years growth. The class also read more than 130,000 pages in just seven weeks during Learning Ally’s signature Great Reading Games, an engagement program incentivizing struggling readers to read frequently and compete for awards, prizes and recognition for them and their schools. Contact Learning Ally at 800-221-1098. Schedule a demo at http://www.learningally.org/educators.